Boy Scouts: Outdated humor from Boys' Life magazine. 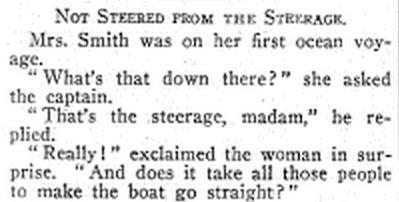 These jokes come from 1910s-era issues of Boys’ Life, the Boy Scouts of America’s official magazine, which is available in fully scanned form via Google Books. The magazine was founded in 1911, a year after the BSA itself. In the 1910s, Boys’ Life ran a mix of adventure stories; pep talks from prominent men within the organization; advice on running Scout troops (there was a lot of confusion regarding procedure in those first few years); and columns about nature, wireless radio, and electricity. The section these jokes came from was called “Think and Grin” and featured a mix of riddles, jokes, and miniature brain-teasers. (Here’s a sample “Think and Grin,” so you can see the jokes in context.) Often, the writer would solicit contributions directly from Scouts, offering small prizes for winners. These little bits of humor are often as groaningly awful as the jokes kids like today. But in their subject matter and their approach, they are striking reminders of how much things have changed in the intervening century. Many “Think and Grin” jokes rely on knowledge of farm life for their humor. There are a large number of chicken jokes, some of which will likely be lost on 21st-century readers. If Scouts were familiar with farming, they were also expected to be comfortable with technology and science. Often jokes rested on the difference between a Scout “in the know” and a person ignorant by contrast. In a common scenario, a lady or a girl would come into contact with technology and react in complete bewilderment. But maybe everyone—especially everyone who was old—had trouble with new technologies. Corporal punishment, once far more common and accepted in the United States, was so normal at the time as to form the basis for humor. I may be misinterpreting this one, but I think it’s fairly bawdy, for the Boy Scouts. Scout Law No. 6 is the injunction to “Be Kind,” even to animals. The pun here is groanworthy; the reason for using “Daniel Boone” and “Kit Carson,” unclear. 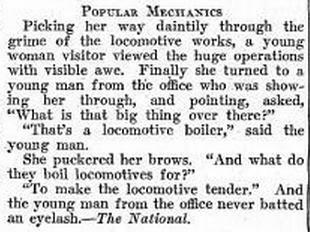 Topical humor about World War I poked fun at “slackers” who refused to do their duty. And made hay out of tragedy.